There seems to have been a burgeoning interest in the Women’s Suffrage Movement recently, if prime time television is anything to go by anyway. Last week we had Clare Balding’s Secrets of a Suffragette on Channel 4, investigating what really happened when activist Emily Davison threw herself in front of the King’s Horse during the Epsom Derby on the 4th of June, 1913, and last night saw the first episode of BBC Four’s Up the Women, a comical look at the struggle for women’s suffrage. Written by and starring Jessica Hynes, the programme, despite its comic edge, seems to be fairly historically accurate, and we wonder if Jessica visited any archives during her research for the series. The biggest battle of all seems to be against other women: “Women in trousers! Driving motor cars! Is that what you want?” exclaimed one of the less inclined characters. The costumes in particular seemed very authentic, and reminded us of some items from our own textile collection. As luck would have it, last night’s programme coincides with an archive visit today by a researcher interested in GSA’s very own suffragette Ann Macbeth. As such we had an excuse to dig out some of our own textiles from the time. The focus at the time seems to have been on domestic items: table runners, place mats, teacosies, aprons, collars; but with an emphasis on making the everyday beautiful. The colours are also often surprisingly bright, and one or two of our items even feature the recognisable purple, white and green of suffrage. See our previous post about Ann Macbeth, written to celebrate International Women’s Day on the 8th March. You can watch Up the Women on BBC iPlayer. Jade Richardson is a Product Design student at Glasgow School of Art. She recently undertook a new project about WW1 and was interested in looking at the School during this period, the Roll of Honour in the Mackintosh building, and the students and staff who participated in the war. We asked Jade about how she’s been using the Archives and Collections Centre in her work. Why did you use GSA Archives & Collections? For my last Product Design Year one project, we were told to look at how the upcoming World War 1 centenary could be commemorated in a more personal and less generic way. Being new to the School, I knew that it had a rich history but was unaware of its participation, if any, in the World War. I decided to look into this history in order to create a personal experience for GSA students to commemorate the war. Along with the Library’s rare books collection, I also used the Archives and Collections to find documents that linked the School to the war and explained its participation. Had you used archives or museum collections previously? I had been to the archives once before during a GSA tour guide meeting where we saw some of the School’s architecture plans as well as learnt more about Charles Rennie Mackintosh. It was because of this original discovery that I knew the Archives would be my largest source of information for my Product Design project. What was your experience of visiting the Archives & Collections Centre? I was constantly blown away by the amount of information the Archives hold, especially about World War 1. The working space was perfect: quiet, well lit, big table, comfy chairs. I almost did not want to leave! The staff was always on hand to answer any questions I had as well as take me up to the Library Store where the Eugene Bourdon memorial is. Overall my experience was extremely positive and fruitful! The appointments were easy to set up and I could tell that the staff were thinking about my project almost as much as me, wondering what other documents they had that might be of interest to me. What did you find out from our holdings? Initially I was only using the Archives to discover information about the School and World War 1. I learnt more about the unnoticed Roll of Honour on the Ground Floor as well as facts about some of the students and staff on the Roll. My favourite finding was of floor plans showing how the School was used to house the Students’ Tryst Fund in 1914. They were exactly what I needed for my project and gave it a clear structure. In the end my project’s aim was no longer to solely commemorate the war but also the School and everything that has happened since then. Has your visit led you to using other Archive / Museum sources? My visit encouraged me to look online, especially at the Hunterian’s collection of Mackintosh drawings. But since my project was so specific to GSA, no other source gave me all the information as a whole. The few sources online were always confusing and incomplete, inviting me to speak directly to the Archives’ staff. For her project, Jade proposed MackInTime, a phone application that allows you to learn, explore and discover more about the Mackintosh Building. It allows you to customize your tour, giving you the freedom of time and what to read and look into. This app also gives you access to online resources like the Hunterian Museum as well as Glasgow School of Art’s Archives and Collections blog and Flickr. The threat of demolition looming large over increasing numbers of Brutalist buildings has inadvertently thrust the style back into the public conscience. There was even a feature on The One Show last night… Down the road at University of Strathclyde, planners are still refusing to rule out demolition of its famous architecture building while in England, Preston Council’s bid to block Preston Bus Station being granted listed heritage status rumbles on. 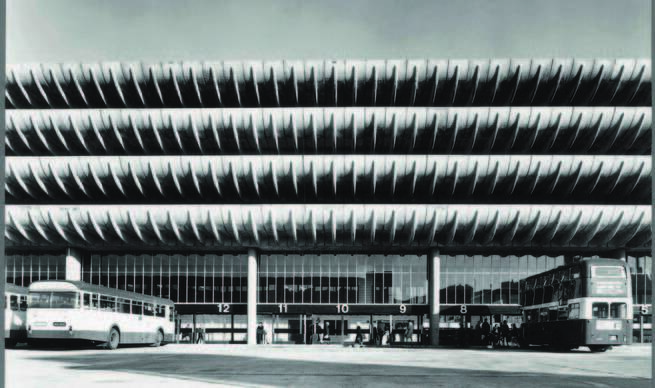 Brutalist architecture has courted controversy since its inception in 1950s Britain. Simultaneously held up as an affordable solution for public buildings and cheap housing and as an urban decay problem, the buildings have, over the decades, weathered the critics little better than the elements. As more beleaguered buildings are condemned to demolition, efforts are being stepped up to conserve the architecture style’s heritage. 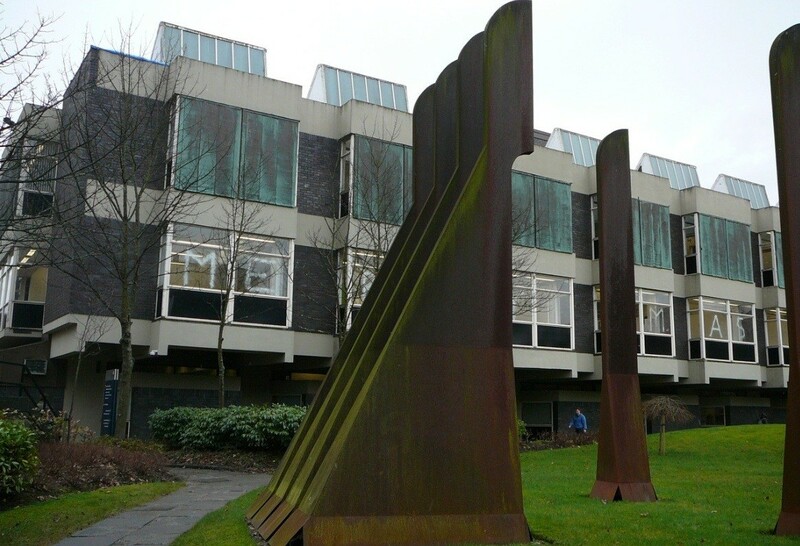 Enter research student Ross Brown who has launched the website scotbrut.co.uk to accompany the Scottish Brutalism project at the University of Strathclyde. The site is modestly being billed as a work in progress, downplaying the extremely useful and well-researched content on offer. The aim is to illustrate the quality and variety of the architecture style around Glasgow and the west region of Scotland through the continuous mapping, documenting and archiving of prime examples. There are a number of high-quality images of the Strathclyde campus and the Charing Cross area, as well as an article by Brown on Glasgow School of Art’s former Newbery Tower. Our top tip would be to check the links to other sites, which lists Robert Proctor and Ambrose Gillick’s project-blog on Roman Catholic Architecture in Britain, and the illustrated online database of Gillespie, Kidd & Coia images. The fact that many of these sites have direct relevance to the Brutalist style, is in itself, evidence of growing popular interest. 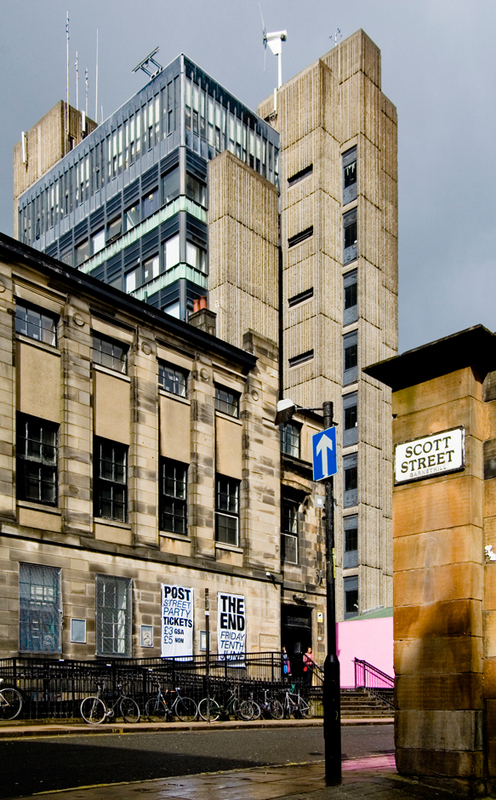 To be alerted to new posts from the scotbrut.co.uk website, follow @scotbrut on Twitter, or join the mailing list. This post was reblogged from the excellent GSA Library Architectural Resources blog. The Studio, a designing, making and textiles club for 10-18 year olds in Glasgow, has teamed up with the GSA Archives and Collections for an exciting 15th month project called ‘Sew Last Century!’. Funded by the Heritage Lottery Young Roots programme, the project will enable 60 young people from Glasgow to explore the Textiles heritage of their city, learn some heritage skills, and create their own designs based on the treasures they find in the GSA archive. The project began this month with a behind the scenes tour of the archive and a chance to view and sketch from the work of 1950s textiles graduate Sylvia Chalmers. The ‘Studioettes’ loved seeing Sylvia’s work – from student sketchbooks, painted designs and fabric samples, to professional screen printed cloth – and filled their own sketchbooks with ideas to take back to The Studio HQ in Partick. Since then, the ‘Studioettes’ have been hard at work turning their research into costumes for Glasgow’s West End Festival Parade. A new exhibition called Scots at Work: Celebrating Scotland’s Extraordinary Working Archives is currently running at The National Records of Scotland. Celebrating Scotland’s extraordinary working archives, the exhibition including rarely-seen documents and objects from Scotland’s archives and museums, as well as the National Records of Scotland. From Antarctic adventure to tartan, from banking to engineering, and from coal to the world’s best-selling whisky, this exhibition celebrates the diverse heritage of Scotland’s businesses, and their products and services. Scotland’s working archives provide fascinating evidence of the nation’s companies, consumers and employees at home and abroad over hundreds of years. Six key areas represent the lives of Scots at work. They highlight Scotland’s precious archival legacy, and the special role that archives play in preserving it for the benefit of all. For artists and designers the textiles section may be of particular interest. The exhibition is part of the Working Archive awareness campaign, which aims to encourage archives, their users and the public at large to celebrate the heritage of Scotland’s businesses; the records of the products and services they delivered; and the legacy of working Scots of all kinds – whether in business, farming, healthcare, education, the church or government. The campaign also seeks to illuminate how archives themselves work. It is an opportunity to raise awareness of the special role that archivists play in communities, and on behalf of the organisations and users they serve. In short, the campaign is a celebration of Scotland’s extraordinary ‘working archives’. A fantastic gallery of images is available to view online and is an excellent resource and possible source of inspiration. The exhibition is at The Adam Dome room in General Register House at the National Records of Scotland. It’s on now and runs until Friday 21st June. This free exhibition is open Monday – Friday 9:00 to 4:30 (closed 6 May).You can find out more about the exhibition here. Reflections on the creation, examination and dissemination of arts organisations’ archives. Many arts organisations are interested in locating and exploring their archival heritage. What are the driving forces behind this interest? How much archive material survives, where and in what condition? What can archives tell us about the history of these organisations and how important are they to their contemporary activities? This study day aims to explore these questions, providing reflections and case studies from academics, curators, artists and archivists. Organised by ARLIS\UK & Ireland in partnership with The Glasgow School of Art and Glasgow’s Centre for Contemporary Art. Supported by funding from the Arts and Humanities Research Council. Contributors will include Dr Dominic Paterson (University of Glasgow); Ross Sinclair; Marysia Lewandowska; Dr Julie Bacon (University of Kent); Dr Francis McKee (CCA Director and GSA Research Fellow); Prof Beryl Graham (CRUMB at University of Sunderland); and Donna Romano (NIVAL). When: 1 July 2013, 10am-4pm approx. Email the giving_up_the_archive_booking_form to bookings.art@gmail.com or post to Lorraine Blackman, ARLIS Administrator, GSA Event, Victoria and Albert Museum, Cromwell Road, London, SW7 2RL. Refreshments will be provided during the day: a drinks reception will be provided after the event, please indicate in your booking email if you do not wish to attend. Archivists at the University for the Creative Arts have been busy collating examples of how students and other artists have been using their archives and special collections for creative practice. An exhibition by five UCA students. The images in the far right and on the screen are still shots from the Maidstone Oral History Project, put up by Fine Art student Joanna Robinson, recording memories of ex staff and students from the Maidstone College of Art. They have collated these case studies to form a Pinterest site. At the moment the site features an exhibition by five art students which uses still shots from the Maidstone Oral History Project recording memories of ex staff and students from the Maidstone College of Art. There are also images of UCA Fine Art student Faith Cannon’s collages using images from the Maidstone Archive (above). See also UCA’s Archives and Special Collections blog. For more information about UCA’s holdings and contact details see their Archives and Special Collections website. Archiving the Arts – why and how? The National Archives have embarked on a new collection strategy called Archiving the Arts. The arts is a complex area to archive, because arts organisations’ and artists’ heritage is more than their documents and records: to capture the essence of an art form for posterity, a variety of audio and visual media are often needed, and objects can be a crucial part of the heritage too. Though many arts archives already exist and can be very rich and exciting in content, there is a real danger that other aspects of the arts will not be accessible in the future. Archiving the Arts is a direct response to the needs of the arts community, who are increasingly interested in exploring a ‘second life’ for their archives and collections. The first stage is well underway: a survey of current practice among funders, collecting archives and arts practitioners, it aims to gather the views and capacity of those involved or potentially involved in archiving the arts. Survey reponses will help us to plan at both a strategic and a practical level, from influencing future infrastructure to what training workshops might be most productive to help us archive the arts. For more information about the project click here. See also this useful blog about a US conference addressing similar issues that took place last year. All This Stuff: Archiving the Artist edited by Judy Vaknin, Karyn Stuckey and Victoria Lane was published earlier this year and is a useful publication expoloring the documentation of creative processes. A few months ago we blogged about artist Nicola Naismith‘s use of archives in her creative practice in a project based at the Norfolk Record Office (NRO) in Norwich and the Parliamentary Archives (PA) in London. The project was a commission to make a digital artwork from documents in both the Parliamentary Archives and Norfolk Record Office focused on the 1821 Land Tax Act. Well the project is now completed and is live on Youtube. You can also find more information on the following blog posts here and here. We’ve recently added some case studies to our website about how various types of researchers have used Glasgow School of Art’s Archives and Collections Centre. So far these include information about how, for example, Ambrose Gillick, an architectural researcher, has used the Gillespie, Kidd & Coia archive in his work on the project Roman Catholic Church Architecture in Britain 1955-1975, and about how designer Gabriella DiTano of Risotto Studio (who we’ve blogged about previously) used our photograph collection as the basis for a commissioned piece of work using her celebrated risograph print technique. There’s also some information about how architectural historian Joseph Sharples has been using the institutional archives in his work on the Mackintosh Architecture: Context, Making and Meaning project, and some feedback from Phil Palmer, a researcher with a personal interest in the artist Maurice Greiffenhagen, who was a tutor at the Glasgow School of Art at the beginning of the 20th century. Visit the Case Studies section of our website for more information, we plan to add more examples very soon. Contact us if you would like to use our archives and collections for your own research, be it family history, academic, educational, commercial or for creative practice.